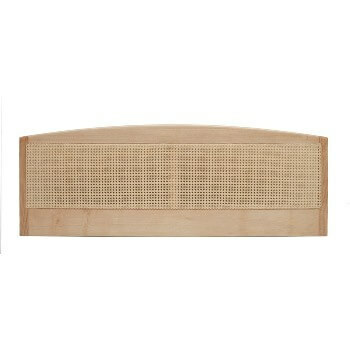 Online Shop | Wooden Bed Headboards for Divans | Edgeworth rattan headboard. The Edgeworth rattan headboard creates a focal point which will make any bedroom beautiful. Finely crafted in the highest quality solid Ash, this simple yet effective arched cane panel design with a curved smooth top complements the wood perfectly. This headboard is available in a range of finishes including Natural Ash, Light or Dark Oak, Mahogany, Light or Dark Cherry and White. Proudly made in Cirencester, Wiltshire, UK.